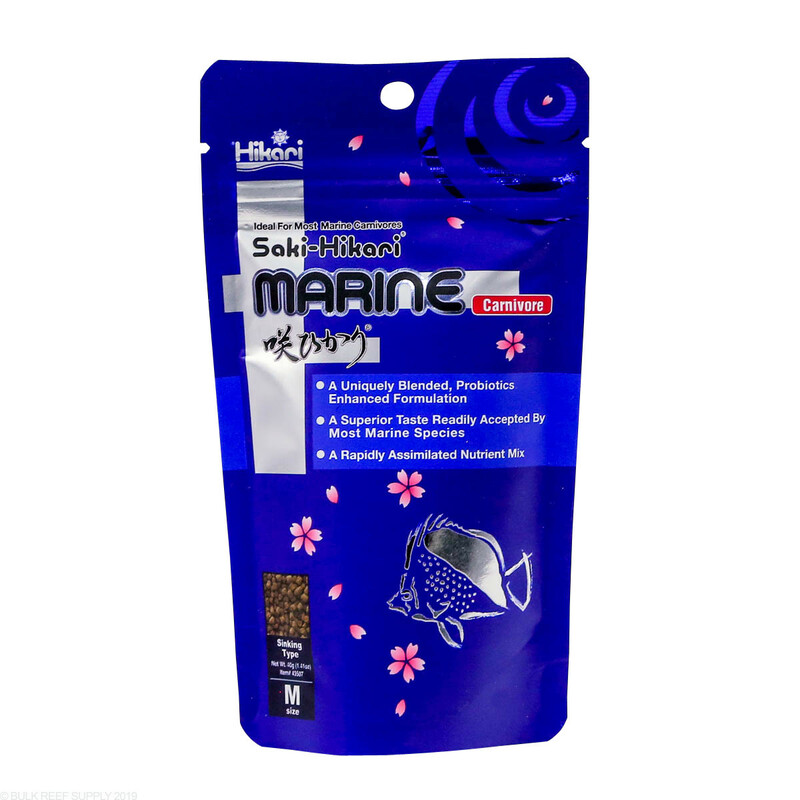 Saki-Hikari Marine Carnivore fish food is a probiotic, medium sized pellet that contains a high protein content. The slow sinking pellets are highly digestible, and with their unique texture fish crave Saki-Hikari pellets. 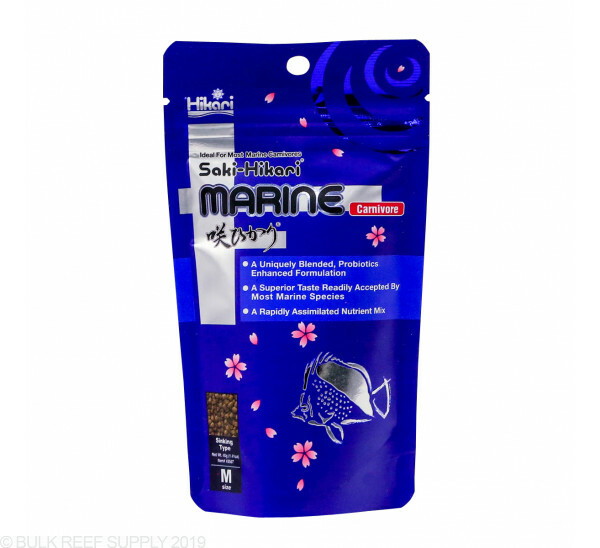 Saki-Hikari includes a probiotic specifically designed for fish food called Hikari-Germ and is packed with multiple types carefully selected proteins. The natural sources of food will help increase coloration, and immunity in your fish while providing a wholesome diet. Saki-Hikari food will rapidly hydrate and will slowly sink when added directly to the tank allowing inhabitants at all levels in the water column to consume. The carefully selected ingredients along with Hikari-Germ aid in the digestion process, allowing your fish to get the most out of the food. It is much better to feed your fish multiple times a day over a single large feeding. Feed no more than your fish will consume in a 1 minute period up to 3 times a day. Overfeeding may cause poor water quality and may lead to high nutrient levels. Ingredients: Fish meal, krill meal, wheat flour, cuttlefish meal, dried seaweed meal, whole crushed silkworm pupae, fish oil, brewers dried yeast, spirulina, sodium alginate, lecithin, taurine, DL-methionine, astaxanthin, dried Bacillus subtilis fermentation product, clam extract, extracted marigold flower meal, garlic, choline chloride, vitamin E supplement, L-ascrobyl-2-polyphosphate, inositol, d-calcium pantothenate, riboflavin, vitamin A supplement, thiamine mononitrate, pyridoxine hydrochloride, niacin, folic acid, vitamin D3 supplement, biotin, monosodium phosphate, ferrous sulfate, magnesium sulfate, zinc sulfate, manganese sulfate, copper sulfate, calcium iodate. Great food for ALL of my fish and shrimp! Everyone’s fat and happy from my melanaurus wrasse to the small damsels. Works great in auto feeders too. I love these they drop a the right rate so when the auto feeder drops them they float enough time but drop slowly that they don't end up in the sump and waste food and ad to nutrients waste. Fish all eat this well. Clowns, tomini tang, yellow wrasse, Lubbock's wrasse, bangaii, flameback angel and even the cleaner shrimp. Small size pellet that doesn't sink straight to the bottom. Are the pellets bigger than 1m? What size are they? The medium carnivore pellets are a bit more than 1mm, and most will be at about 2mm in size, with a fairly uniform size and shape.